Very fast delivery! Exactly what I wanted. Amazing smell for all seasons. Will definitely purchase again for myself when I run out and thinking about purchasing as a gift for someone as well. Launched in 2012, 'Manifesto' by Yves Saint Laurent features a feminine blend of bergamot, white flowers, cedar, sandalwood, vanilla and tonka bean. This women's eau de parfum is available in a 1.6-ounce spray. This scent is soft and beautiful. Love, love, love. Modern in a classic sort of way. Like a warm and fuzzy sweater -- perfect for fall and winter. Vanilla and spice and everything nice. Dries down deliciously, without being overtly gourmand. Not my favorite YSL, but definitely in the top three. This is my all time favorite perfume of mine that I have ever tried thus far! It's such a beautiful scent and mixes well with my skin love love love it! I just love the scent. I been looking for this product no where to be found I wish there was a bigger bottle but when I open n spray on me freaking love it I was happy again lol last me all day I purchase another one today before it’s gone . "Hello! 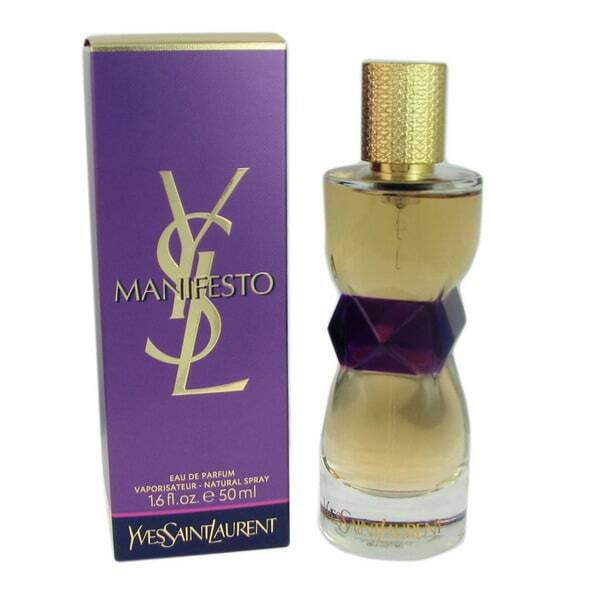 Is this Yves Saint Laurent 'Manifesto' manufactured in France? Thank you!"